That’s just one of the benefits of having your TV wall-mounted. Getting your TV up on a wall has other advantages, including giving you more floor space for furniture. Ask anyone who’s tried it and they’ll tell you that while the results are well-worth the effort, getting a TV up on the wall is no easy task. Ensuring the bracket is firmly attached to a wall that can support it, and that the TV is firmly (and evenly) attached to the bracket is a tricky job that’s best left to the experts. No one wants to be watching a tilted TV, or damaging their beloved television during installation. Sure it depends on the size of the TV and here at Maidstone Aerials & Satellites, we’ll install TVs of all sizes throughout your home or workplace, from a smaller set in your kitchen on a movable bracket to a big 60” screen in your home cinema, and everything in between. 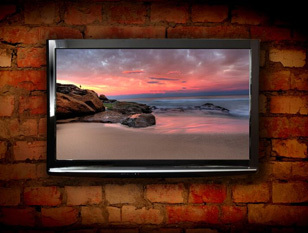 Plasma TVs in particular require special care when wall-mounting. Why risk ruining your set when you can call in the experts and trust us to do the job quickly and professionally. Need a custom installation for your bar, restaurant, gym or other public space? Our Technicians are ready to deliver the bespoke wall mounted TV solution you need, whether it’s one big screen or multiple TVs. And we’ll make sure all cabling stays out of sight and out of mind, so your place stays looking great. All our Technicians are experienced and their work fully insured. Don’t risk disappointment. Get your wall mount done right first time by experts. For fast and efficient TV Wall Mounting in Kent, just call 0800 316 2715.